Rain will move into the area and become steady overnight. 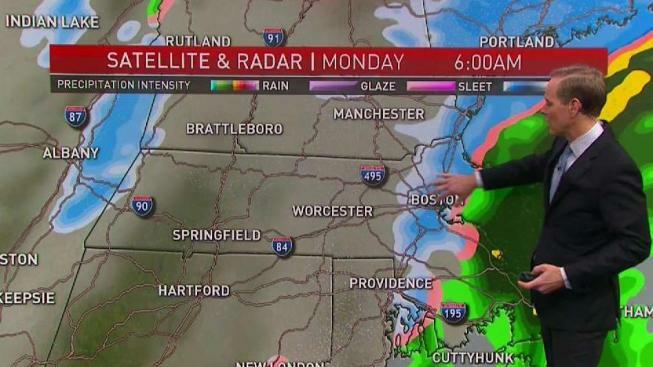 Commuters in southern NH, Central Massachusetts, Merrimack Valley and Northern New England will see the messiest commute. Accumulations will be minor, about a dusting to one inch in some areas. After yesterday’s warmth, temperatures will be in the 30s and 40s today as winds come in out of the east-northeast. Rain will spread up from the south during the day as well, becoming steadiest overnight as an area of low pressure passes by. While it will stay warm enough for plain rain during the day and much of the night, in most spots, a light wintry mix will impact chilly communities north and west of Worcester. That’s where we’ll have some slippery travel. Colder air continues to drain in overnight, so by the Monday morning commute more areas north and west of Boston will start to see snow and a wintry mix. That will result in slow downs, especially in Southern New Hampshire, Central Massachusetts, the Merrimack Valley, and in Northern New England. 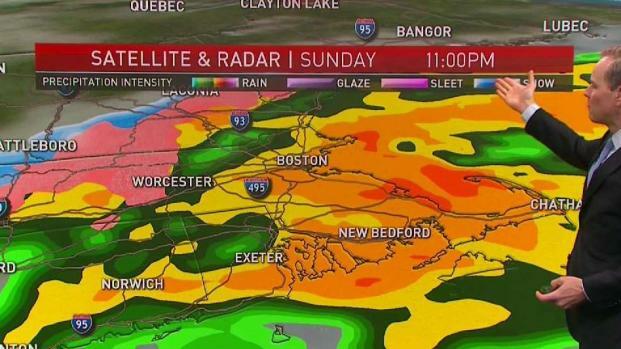 Closer to Boston most roads will likely stay just wet, even though there still may be some wet snowflakes in the air. Sunday: Mostly cloudy, showers return. Some mixing north & west. Highs in the 30s and 40s. 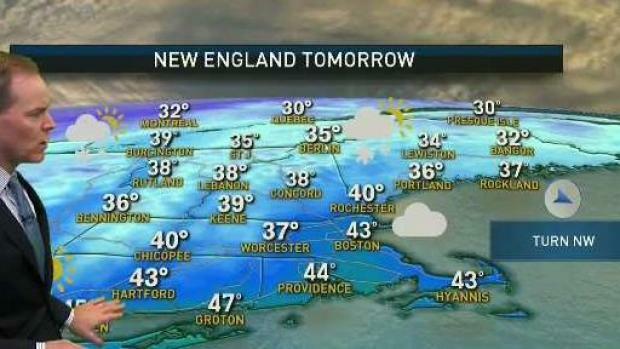 Sunday Night: Showers near the coast, snow and mix inland. Lows in the 30s to around 40. Monday: Early wintry mix, then mostly cloudy. Highs around 40. Accumulations will be very minor, just a dusting to 1 inch for many. Once you get to Western Massachusetts, Northern Worcester County, and Northern New England totals will reach 1- to 3-inches. About 3 to 6 inches is currently expected in Eastern and Northern Maine, as well as the mountains, because snow will last into Monday afternoon and night. Elsewhere the precipitation shuts down around midday Monday, and some sun pokes out during the afternoon as winds turns out of the northwest. Chilly sunshine returns Tuesday with highs in the 30s. We stay quiet and dry for most of mid-week, in fact, as temperatures climb into the 40s. Our next storm to watch arrives Friday, but for now this looks like another warm storm with highs potentially back into the 50s. Right now there don’t appear to be major storms on the horizon as we get closer to Christmas.